Be the first to share your favorite memory, photo or story of Dennis. This memorial page is dedicated for family, friends and future generations to celebrate the life of their loved one. 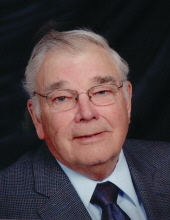 Dennis Amundson, age 75, of Ivanhoe, MN passed away on Wednesday, April 3, 2019 at his home near Ivanhoe, MN. Funeral service will be 1:00 p.m. on Tuesday, April 9, 2019 at Bethany-Elim Lutheran Church in Ivanhoe, MN. Burial will be in the Lincoln Icelandic Lutheran Cemetery, rural Ivanhoe. Visitation will be 5:00 – 7:00 p.m. with a 7:00 p.m. Prayer Service on Monday, April 8, 2019 at the Bethany-Elim Lutheran Church in Ivanhoe, MN. The Houseman Funeral Home, Birk Chapel of Ivanhoe is entrusted with the arrangements. Dennis Bernard Amundson was born June 23, 1943 in Tyler, Minnesota to Bernard and Clara (Hoversten) Amundson. He was baptized in Hemnes Lutheran Church in Minneota, Minnesota. He was confirmed in Bethany-Elim Lutheran Church in Ivanhoe, Minnesota. He graduated from Ivanhoe High School in Ivanhoe, Minnesota in 1961. He was united in marriage to Donna Almjeld on March 24, 1962. They were blessed with four children: Debra, Darla, Duane, and Daniel. Dennis was a member of Bethany-Elim Lutheran Church in Ivanhoe, Minnesota. Dennis and Donna lived and operated a dairy farm in Limestone Township until 2008 when they retired. They continued to live on their farm until two weeks before his death when they moved to their new home, still in Limestone Township. Dennis loved to farm. He also served on several boards in his life, including his roles as the Limestone Township Treasurer, Director of the Farm Credit Board, and the Southwest Minnesota Dairy Board. He measured land with the ASCS Office and recently volunteered to drive for Western Community Action. The most important moments in his life were spent with his children, grandchildren, and great- grandchildren. He loved being at the lake- everything tasted better at the lake. He loved teaching and playing cards with his grand and great-grandchildren, specifically Beggar Your Neighbor. He taught them all to drive through alfalfa fields and would stop at night to point out the Big Dipper and shooting stars. Dennis is survived by his wife Donna; his four children: Debra (Wayne) Bednarek, Ivanhoe, MN, Darla (Daniel) Gladis, Osakis, MN, Duane (Jacqueline) Amundson, Ivanhoe, MN, Daniel (Kari) Amundson, Dassel, MN; his 14 grandchildren: Jason (Robin) Bednarek, Jessica (Barry) Gronke, Joshua (Rachel) Bednarek, David (Rachel) Gladis, Daren (Kendal Orgera) Gladis, Douglas (Russ Webber) Gladis, Darcy (Andrew Vandenbroeke) Gladis, Edwin (Kara) Amundson, Samuel (Alissa) Amundson, Lucas (Shania) Amundson, Emily (Nick Selseth), Erynn, Ellynn, and Evan Amundson; 13 great-grandchildren: Maddison, Alexsa, Jayda, Jaxsen Bednarek, Trey, Tyler, Tiffany, Trevor Gronke, Joshua Jr., Timothy Bednarek, Olive, Mabel, and Thorfinn Gladis; one sister, Karen (Jack) Kilby; one brother-in-law, Ronald Almjeld; one sister-in-law, Norma (Terry) Renken; and many nieces and nephews. He is preceded in death by his parents, Bernard and Clara Amundson; his parents; in-laws, Earl and Edna Almjeld; sister-in-law, Karen Almjeld; and brother-in-law, Robert Almjeld. To plant a tree in memory of Dennis Bernard Amundson, please visit our Tribute Store. Prayer Service will be at 7:00 p.m.
"Email Address" would like to share the life celebration of Dennis Bernard Amundson. Click on the "link" to go to share a favorite memory or leave a condolence message for the family.